I passed up on the chance to go see Margaret when it was quietly released in Chicago. Screening at only one theater in the downtown area, its mixed critical reaction didn’t provoke enthusiasm. I also wasn’t much of a fan of Lonergan’s bland debut feature, You Can Count on Me. Margaret’s long legal battle (the picture was filmed in 2005) and persistent issues in the editing room (a problem that persists with the finished film) gave me the impression that missing the film was no big loss. But the film’s vocal fans made me reconsider my initial assumption. Based on the large showing for its weeklong run at Chicago's Gene Siskel Film Center, it seems like a lot of people are giving in to the buzz. Margaret is an imperfect film. Its issues range from a peculiar sense of scope to some baffling narrative detours. It’s an incredibly emotional picture, though imbalanced – Lonergan can deftly create one scene of such genuine emotional gravitas only to follow it up with a screeching shouting match that lacks finesse from all parties involved. But even with its imperfections, Margaret is so incredibly ambitious for what it sets out to do. For about an hour and a half of the picture, Lonergan allows his audience to empathize with a guilt-stricken high schooler who witnesses the gruesome death of a woman on a New York City street. As Lisa, Anna Paquin admirably tackles Lonergan’s script with a sort of precocious vigor that may seem a bit jarring at first, but soon becomes the film’s strongest asset. Her character is one who is guided by a very flexible moral compass that seems to bend and break on the whim of the attention that is levied to her. She is an especially unlikeable person, though her actions aren’t wholly disagreeable. The crucial surviving aspect of Margaret’s editing process has been the way in which Lonergan was able to slowly unravel the intricacies of Lisa’s character. With an opening sequence involving the masses of New York City, Lonergan makes it quite clear that he is mining for a narrative that will address the New York mindset – particularly one that addresses a post 9/11 perspective. The only film to have really addressed the topic tactfully was Spike Lee’s 2002 effort, 25th Hour. With Margaret, Lonergan utilizes youth, the nature of grief, and the New York City landscape to address a macro perspective. The results are messy, but the emotional terrain beckons chaos. And as the narrative framework is built, the audience is guided through a maze of emotions, wherein Lisa makes sense of the trauma with everything else that is going on in her life. Somewhere in the film’s final hour, Lonergan makes a crucial judgment on Lisa’s character that forces the audience to reexamine her behavior and actions from the beginning. The moment that it happens, in a spatially tight exchange between Lisa and an acquaintance named Emily (Jeannie Berlin), the picture takes a whole new meaning. Whether Lonergan is making a bold statement on the nature of New Yorkers (or Americans in general) is unclear, but the simplicity of mining a micro narrative to address a macro populous is complicated in this scene. It stands as a sort of “game-changer” type of moment in film that sparks an appreciation for the craft and detail involved. From there, the picture maneuvers its way through some tricky terrain, as the importance of Lisa’s social standing, her relationship to her mother and father, and her attention-seeking come into play. Here, the film shows its scars. Scenes become more jarring and complicate the balance of the emotional work involved. Matt Damon’s role as Lisa’s math teacher is Margaret’s most significant misstep, as his character was obviously butchered in post production editing. 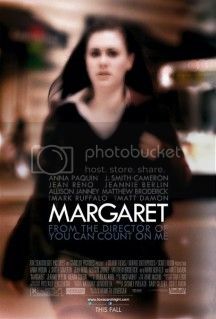 The messiness of it all suits the material, as Margaret is the sort of emotionally complex film that might not have benefitted from a crisp and clean construction. Still, I would really like to the original 3+ hour cut of the film.